It is good to be back in this beautiful city. After landing in Mexico City Christmas night we grabbed a few hours sleep and hopped on a bus to Puebla the next morning. Laurel is getting her first taste of Mexico. 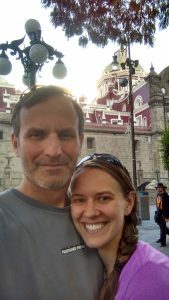 We are settling in preparing for our first acclimatization run on La Malinche tomorrow. 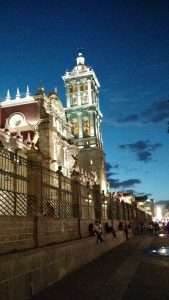 Puebla is awash with Christmas vacationers. It is a festive and jovial place with temperatures in the seventies. 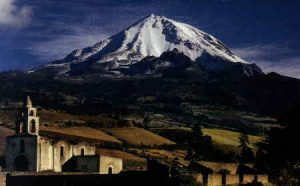 Check back for an update on our Malinche climb. So you may follow us here and on twitter for updates. We will be landing on Christmas evening. I wish everyone a glorious and Merry Christmas. Think you could do this? Wouldn’t it be great if you were able to get a 500 acre piece of land from your county, lease it for $15 and turn around and whore it out to whatever for profit entity you wish? Oh, and did I mention that you could keep taxpayers from using that land for which they pay at your discretion? And people say that the feudal system died in Britain years ago. Well, that is what is happening right here in Knox County. Check it out. (If you find this somewhat egregious, an email to Mayor Burchett should be in order. Perhaps he can answer your questions as a taxpayer. 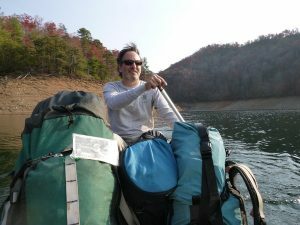 Ijams Nature Center’s Board of Directors will discuss Thursday whether to allow private boats on Mead’s Quarry Lake and how to proceed in reopening the park’s climbing crag. The issues will be discussed at a board meeting at noon, interim Executive Director Bo Townsend said. The decision to re-examine the boating rule comes after Knoxville resident John Quillen repeatedly asked Ijams’ administrators this question: Why should taxpayers have to pay a for-profit company to access a lake on Knox County property? Quillen, who is board president of the nonprofit group Southern Forest Watch, met with the Ijams’ management team on Dec. 8. Quillen said he believes taxpayers should be able to access Mead’s Quarry Lake without having to pay $12 an hour to rent a boat from River Sports Outfitters, as is park policy. 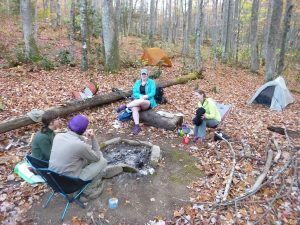 In 2013, Southern Forest Watch sued the Great Smoky Mountains National Park over the park’s implementation of $4-per-person, per-night fees to access the backcountry. The nonprofit lost the lawsuit. 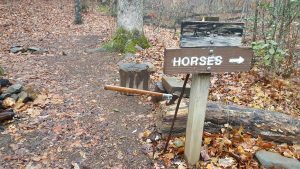 Now, Quillen has taken issue with a sign posted outside the Mead’s Quarry Lake at Ijams, which forbids access to the water “except for paid boat rentals” from River Sports. “No private boats. No swimming. No diving. No horseplay. … Violators subject to $100 fine under City Ordinance #19-161,” the sign reads. Townsend said he was unaware of the sign’s existence until Quillen mentioned it to Ijams’ management team. Townsend is relatively new to the post — he was named interim director on Oct. 3 after Paul James, the director for 12 years, retired. Townsend previously served as executive director for 10 years before leaving the park in 1999. Townsend said he’s “not sure where the sign originated” and doesn’t “understand why it’s there,” but said he intends to find out. He also said he assumes a city ordinance cannot be used to enforce fines on county property. 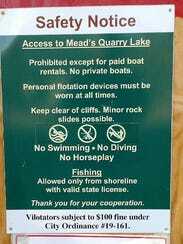 Private boats are forbidden on Mead’s Quarry Lake to prevent overcrowding, Townsend said. 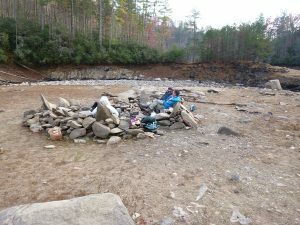 When asked if Ijams can restrict access to a lake on county property, Knox County Law Director Bud Armstrong said Monday that the lease “speaks for its space.” He said it’s a question of policy, not of legality, and that the Law Director’s Office provides legal advice to the county and elected officials – “I don’t provide legal advice to the News Sentinel,” he said. 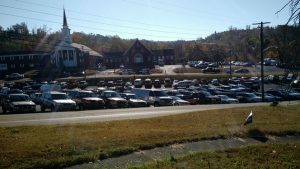 Regarding Ijams’ citation of a city ordinance to forbid access to county property, Armstrong said he doesn’t “know what the intent of (the sign) really means,” and referred further questions to Knoxville Law Director Charlie Swanson. Swanson said Tuesday that Ijams can cite a city ordinance on Mead’s Quarry Lake if the lake falls within Knoxville’s city limits. The park is in city limits: it falls just west of Knoxville’s eastern boundary. Swanson declined to comment on Ijams’ decision to charge patrons to access the waters, saying it is a county issue. 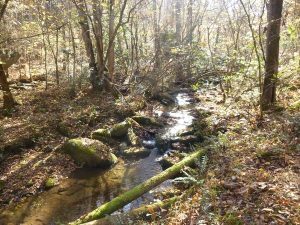 At a Sept. 26 Knox County Commission meeting, a quitclaim deed, which would give Ijams ownership of Mead’s Quarry Lake, was taken off the agenda after Commissioner Brad Anders “brought up some points” to then-director Paul James, Anders said. Under the provisions of the quitclaim deed, Ijams would not be able to charge people to access the lake, according to Anders. “They couldn’t live by that quitclaim deed if they were charging people to float,” he said. 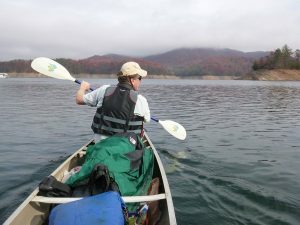 Anders, who acknowledged that he has spent “zero days in law school,” said he believes since the county is leasing Mead’s Quarry Lake to Ijams, the park has complete control over the property and can choose to forbid access to private boats. “It’s like you leasing an apartment or house,” he said. 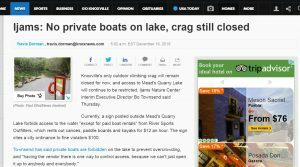 Four weeks after Townsend said Ijams’ climbing crag, Knoxville’s only outdoor climbing location, would be reopened “any day now,” the crag remains closed as the park waits on its insurance provider to cover unsupervised climbing. The crag was closed on Sept. 19, much to the shock and dismay of the volunteers who spent countless hours preparing it for public use. 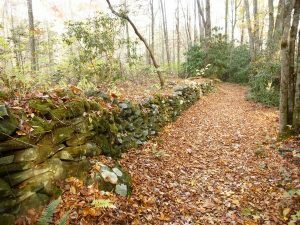 The insurance company estimated crag coverage would cost between $10,000 to 15,000, Townsend said. Quillen says the park could avoid purchasing insurance by giving the land back to the city. Townsend said Ijams is “probably going to have to pursue other options” aside from the current insurance provider, which he declined to name. River Sports owner Ed McAllister has not returned requests for comment. Portions of scarred land along the spur on 12/10. Some sort of fire retardant spray, I imagine. It’s hard to believe that the relatively small fire we witnessed and videoed after Eagle Creek grew to the tragic event in Gatlinburg. Frank and I were there to witness the damage following an afternoon volunteering to assist victims in a warehouse distribution. 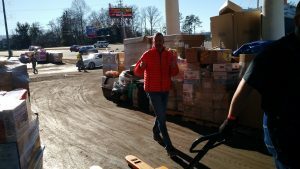 We sorted clothing, hauled pallets, assembled boxes and unloaded automobile donations. The outpouring of support was as impressive as the detritus of the fire itself. We ran into several old friends from the fee fight and had time to sight-see afterwords. I’m glad we went. Frank drove all the way from Nashville because he is committed to helping Smokies folks. Frank is a proud founding board member of Southern Forest Watch. Much has been made about the juveniles who allegedly started the fire. I think the place was a tinder box ready to blow and 60 mph winds will carry it quite a ways. I know adults who are equally irresponsible with their campfires and have quit camping with certain ones as a result. They did say that the Cosby fire was started by a downed power line. I suppose we should all reserve judgement until the facts are complete. You may also be aware that our president elect has proposed an interior secretary that makes no bones about her desire to sell off public lands. She thinks that boundary areas near public lands are impoverished and allowing folks to log, mine and exploit those resources are the ticket out of poverty. As critical as I have become of the NPS and DOI in general, I feel as if this is a most dangerous direction and we all know it is a veil to allow the same robber barons who originally raped the Smokies to do so again unfettered with fracking and all sorts of corporate negligence. What is needed is an overhaul of the NPS management. Our President elect has an opportunity to “drain the swamp” of entitlement at the DOI and eliminate fees entirely. Unfortunately, this new potential appointee has proven that she loves user fees for public lands. If you didn’t see the post below this one, please accept my gift of a free download of my last book. I wish everyone a Merry Christmas. Merry Christmas, here is your gift. I am giving a free digital download of my last book, Father of Ice Mountains to all who have followed these exploits over the years. 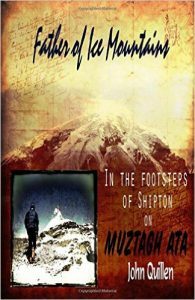 It is an account of my ski ascent of 24,747 foot Muztagh Ata in the Chinese Pamir range and epic descent that resulted in frostbite to most of my digits. The book is readable in many formats and you don’t need a kindle or special device to access the manuscript. Just go to this link and click to purchase, then upon checkout, enter the attached code below. 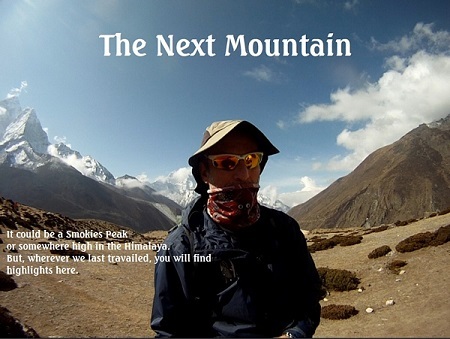 Here is a link to a video of the climb that is pretty interesting made by our expedition sirdar, Asu Ronqin, an accomplished alpinist. http://www.tudou.com/programs/view/wNNWNY6tI58/If you can wait through a commercial it is worth watching. I wish everyone the most happy and joyous Christmas season. Laurel, Wayne and I steer the “Steenhatchie” through low waters of Eagle Creek on Sunday. But wait? Who is Wayne? And how did Laurel get here and why did I lose a passenger? Questions Questions. It all began on Wednesday. 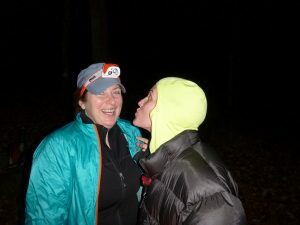 Laurel departed from Knoxtown on her quest to knock off Lakeshore Trail, solo. 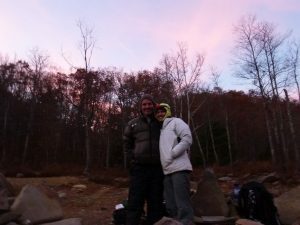 She had concerns about being alone on the trail for 30 plus miles but I assured her that the majority of guys I used to hike with had never spent a single night solo in the backcountry. So she put on her man drawers and embarked from the road to nowhere into nowhere. Because she is not a puss. 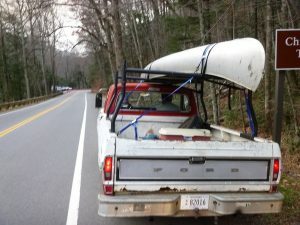 For the past year I have spent considerable time preparing my old truck for this very sojourn. New carb, brakes, alternator, fuel pump, tires, radiator, heater core and voltage regulator. At least that is what I can remember. Then I installed the canoe rack which had to be drilled into the rails. 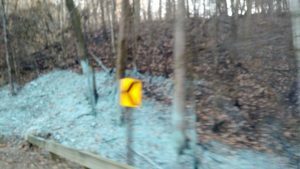 Following a perfect Thanksgiving with my family, Myers and I departed from Knoxville early into the smoke of Walland passing the detritus of a burned hillside. Soon we took on the dragon of 129 and made 10 miles per gallon as we steamed towards Fontana. The SS Steenhatchie plowed through the placid lake of Fontana on a crisp post holiday morning with perfect temperatures on the traditional Southernhighlander Eagle Creek weekend. I first discovered good ole Eagle Creek in the 90s and started bringing folks over there annually for a post turkey extravaganza. I was hiking the Lakeshore myself along with a friend when we stopped here for a break. I could feel the good energy of this spot and vowed to return. Many are the nights we spent around what came to be known as Sithenge. Dozens of groups have joined me there over the years. Those are well documented epics readily found in the archives section of southernhighlanders main site. 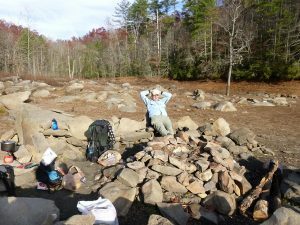 Improvements at Sithenge were compliments of Highlander fold. There was one year when I orchestrated a great rock movement. I knew it would suit me and others for many decades to come. There is something about the inherent relaxing ambience of late Autumn sunbathing on the rock seats so perfectly positioned. It was during one of those moments, after we stowed the Steenhatchie that we were met by Mtn Laurel who timed her arrival in accordance with our docking. We were the first humans to cross her path in three days and she was ready for some company. I was happy to oblige. And she didn’t stink. 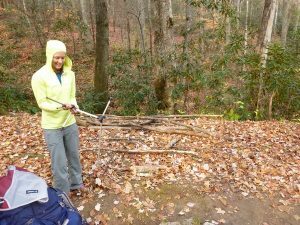 We set up a nice camp and began not to gather firewood. Because there is a fire ban. And we observed the ban, to the letter. But it was contrary to our nature. And you know what? Nothing happened other than a couple of good nights sleep. Anyway, we are lounging about Sithenge when guess who comes walking in out of the blue? Yep, it’s Randy Redwood from Hangover last month and the year before. What a surprise. He had also been out for about five days up Hazel and about. The backcountry is a small place and getting smaller. He and Laurel had apparently passed each other along Lakeshore unbeknownst to either of them. Randy was going to head up to Lost cove but decided to hang out with us for the evening and we thoroughly enjoyed his company. We populated Sithenge under a star filled canopy of grandeur along the shore of Eagle Creek and I channeled Hemingway for a night of fireless bliss. 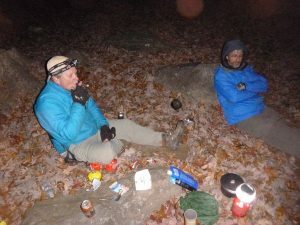 I’ve spent many a big hiking night along the AT sans pyro displays and even though the temps dropped, we found plenty of entertainment in the crystal clear starscape and stimulating conversations. It was magnificent. Especially as Myers is quite the Astronomer who could describe the phenomena passing above in great detail. Now to the bloody hatchet man. Many fans of this page are familiar with the oft related tale of the bloody knife man. 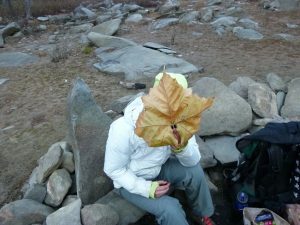 I’m surprised how many folks are familiar with the Southernhighlander antics until I get into the backcountry and have people relate these events from this site. Randy is one who has followed our outings and now he is a part of this story. Anyway, I had been teasing Laurel about the bloody knife man story from campsite 18 many years ago. It was in her head as she passed a campsite. And what does she come upon halfway through her journey? It wasn’t enough that she had encountered many of these critters already. 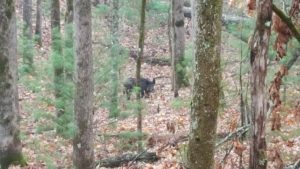 And we both saw a fair amount of hogs. Laurel reckoned she spied near 20. I saw three. So she got a good solo dose of the bloody hatchet man in her campsite. And she powered right through. Intrepid backpacker she is. On Saturday we all headed up towards Shuckstack tower. 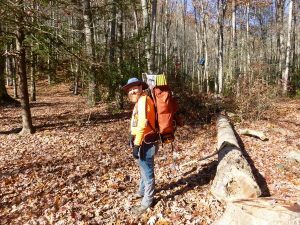 It was a 7 mile roundtrip during which we would say goodbye to Randy Redwood who would finish up down the AT and head back to Nashville. 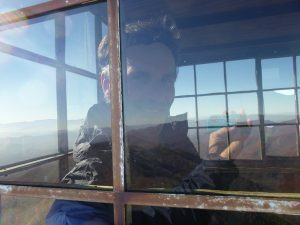 Ironically, I met Randy’s former roomate, Suzette, at the Shuckstack firetower three or four years earlier while enjoying the view on another Thanksgiving outing. Our backcountry gets smaller and smaller. Climbing Lost cove is an exercize in cardiovascular fitness. It is a couple thousand feet in three miles to the summit, which was clear as a bell and completely devoid of smoke. It wouldn’t be that way the next day when Myers re hiked the section to pick up some of his remaining Smokies miles. Myers is near completion of ink. And Laurel is approaching her 350th Smokies mile. She accrued about 37 new ones this past weekend. We were joined by Wayne Willis from Gainesville Fla. It was his first Smokies trip. We sat around our pseudo flame in a much chillier evening on Saturday. Temps had now reached the twenties but we are adaptive creatures who thrive on these sorts of challenge. 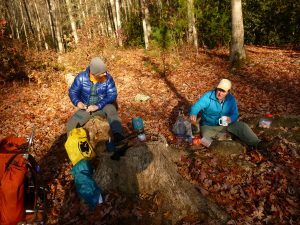 After all, we drove a truck through the dragon, paddled a canoe older than the truck and toted gear more than a quarter mile into a camp. This is the stuff of Highlander lore, the gristle upon which character is milled. No captains are made on calm seas and all earned their wilderness badges in these days. Only the intrepid remain. The fire ban all but ran everyone away from the Smokies but fire will be eternal for some and we were in no hurry to meet such fate on this weekend of perfection. Wayne had injured his foot in his miles out toward Hazel so we put him in the canoe and he helped us paddle back across a choppy channel. Myers went back up and over the hump and we were able to intercept him at the dam. Everyone was happy and we made a new friend. On the return, we picked up Laurel’s car at the Lakeshore terminus unmolested. The 1971 Ford Ranger truck fired back up to haul Myers and I back around through the park in time to witness a now resurgent Chimneys fire that is presently causing the evacuation of Gatlinburg. 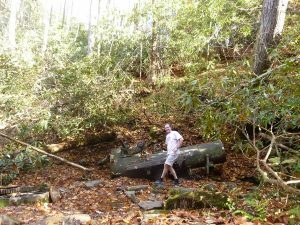 It is as if the Smokies are retaking the land that has surrounded it and I am sorry for any loss of property. One can’t help but note the metaphorical implications of nature versus commerce here. I hope no one is hurt. My personal feelings about fire in the forest is that fire is a natural cleanser. There are certain pine cones that don’t release seeds without the heat of a fire. 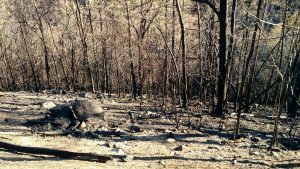 I can remember no wildfires in the Smokies in my lifetime. Myers caught this photo Sunday afternoon. 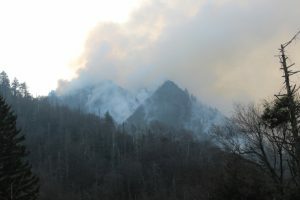 On our return from Eagle Creek we passed the impressive blaze presently consuming part of the Chimney Tops trail. I enjoy watching all of nature, the good and bad. As long as I am not a recipient of the warm end. Hope to have a great write up of our Eagle Creek adventure by mid-week. As it stands, I am too tired to presently offload the canoe from the Ford. But we had some epic times over at good old 90. Check back in around Tuesday or Wednesday. I warned you that you would receive a dose of activism through the Highlander website. Today, I am proud to share this bit of good news from SFW. The Ijams Nature Center’s interim executive director said Tuesday that the Ijams Crag, the only outdoor climbing destination in Knoxville area, will be reopened “any day now,” as soon as an insurance company provides coverage for unsupervised climbers. On Sept. 19, Ijams closed the crag to open climbing after a four-month-long search for a suitable liability insurance policy yielded only one option, which administrators were surprised to learn didn’t include coverage for unsupervised climbers. 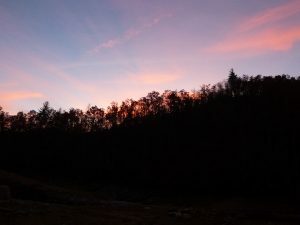 The management team had just three days to make a decision, and they felt forced to accept the plan or risk having to shut down the entire park, said Ijams’ development director Cindy Hassil. Now, only supervised climbing and instruction classes are permitted on the crag, meaning climbers must pay to play. 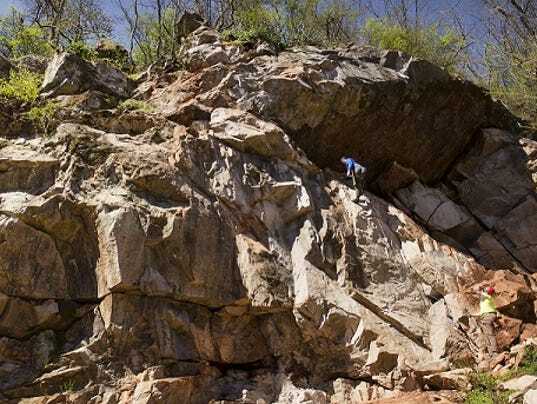 Members of Knoxville’s small but dedicated climbing community who worked thousands of hours to prepare the crag for public use were devastated by the unexpected development. 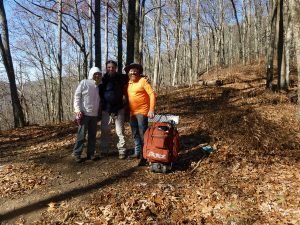 Advocates for access to public lands critiqued the closure as unnecessary, arguing Ijams is not responsible for unsupervised climbers if they do not pay to climb under the Tennessee Recreational Use Statute. 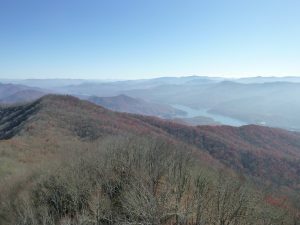 An environmental watchdog group that sued the National Park Service over the Great Smoky Mountains National Park’s backcountry fees told Ijams Nature Center on Sunday it is “prepared to take the next steps” if the crag is not reopened and the quarry’s waters made free to access by boaters. 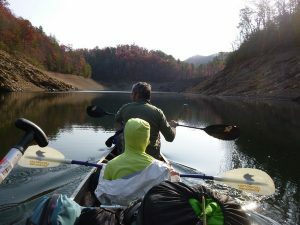 Currently, visitors must pay River Sports Outfitters to rent boats for use on Mead’s Quarry Lake — “Ijams’ current liability insurance does not authorize private boat use,” the park’s website reads. 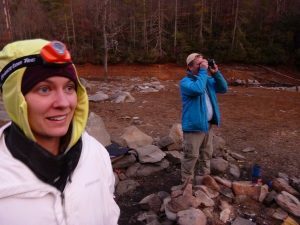 The Southern Forest Watch, a nonprofit group, argued in a 2013 lawsuit that the Park Service was wrongfully restricting taxpayers’ access to the Smokies’ backcountry by charging $4 per-person per-night fees. On Sunday night, John Quillen, the group’s board president, emailed Townsend to say “many in the climbing community … see the same thing festering right in our own backyard at Ijams. Townsend responded on Monday morning, saying Ijams is “in the process of reopening the climbing crag.” He said Quillen’s concern about the quarry was a new issue to him, and that he needed to discuss it with Ijams’ Board of Directors and get back to him. Townsend told the News Sentinel on Tuesday that the park decided to purchase insurance to cover open climbing on the crag, despite some saying it isn’t necessary under the Tennessee Recreational Use Statute. He said he does not interpret the law that way. “They’re covering themselves so they can charge people to go use the crag,” Quillen said of Ijams’ decision to purchase insurance. Regarding Mead’s Quarry, Quillen said that if Ijams plans to continue to charge visitors to take boats on the waters, he would like to see administrators delineate that the quarry is not on city property. It was a fantastic weekend. Starting early Saturday morning, I rose to a breakfast at Ijams Nature center, then across the street for the Fall Festival. When I say across the street from my house, I mean, across the street. 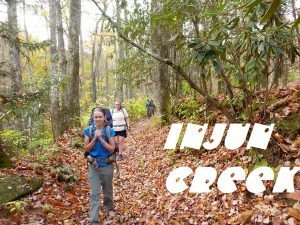 After enjoying a huge party across the street with about a thousand of my closest friends, I rushed off to intercept Laurel, Terri, Tom and Sarah at Injun Creek. Since I knew the Manway, it was but a short 40 minute walk to camp. Laurel took off to capture miles towards the Dudley trail and I walked about and made the pilgrimmage up to the Engine, aka Injun. We had a delightful evening, devoid of fire, of course because of the fire ban. Ahem, Ahem. 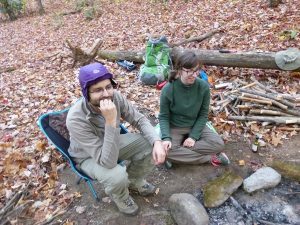 Tom and Sara were waiting for the sun to fall before meditating upon our imaginary fire. It was a shame because there was so much wood lying about. There was that awkward moment when no one seemed sure of Laurel’s intentions here. Come to think of it, I believe Terry was aware of Laurel’s intentions. The next morning we cruised out and gassed it back to Knoxville for some Indian food at Bombay, the best in town. Outstanding weekend. 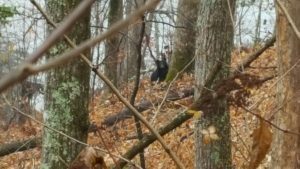 I cannot remember the last weekend we weren’t in the woods, I am thinking this has been a two month run of consecutive weekend outings. It brought me back to a time in the 90s when Ed Lee and I would do strings of weekends. The biggest one Ed and I did was 34 consecutive weekends. And I wasn’t even clicking miles in those days. We just grabbed a park map and hit the road. It was incredible. I have enjoyed this past year because it brings me back to a simpler time when the Smokies were a mystery and every corner held some new amazement. Escorting Laurel brings me back to that simple time of good company and respect for the environment. Gone are the days of backwoods bacchanals or outshouting owls and coyotes. (although Eagle Creek this year may have some of that) Again, there is a time and place for everything. A new era has emerged and I am liking it more and more each outing. As a salute to the old times, I am reminded of this song.